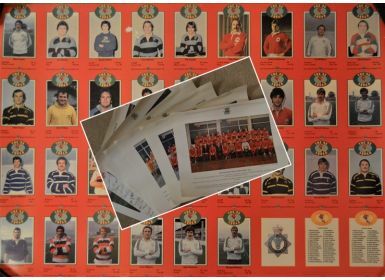 Welsh Rugby Squad Photographs and Cards: Series of 8 standard but attractive, if somewhat curled, official Wales Rugby Squad pictures, from 1974-5 to 1982-3, missing just 1981-2. Includes the Centenary Year with facsimile signatures included to border. Also with an unusual printer's large uncut A2 sheet bearing all the 34 WRU '82 Squad members' cards, which were handed out with hints from the S Wales Police. All ideal for framing. Quite good, a little wear.